India is a developing country and our economy is a mixed economy where the public sector co-exists with the private sector. For an overview of Indian Economy, we should first go through the strengths of Indian economy. India is likely to be the third largest economy with a GDP size of $15 trillion by 2030.The economy of India is currently the world’s fourth largest in terms of real GDP (purchasing power parity) after the USA, China and Japan and the second fastest growing major economy in the world after China. Indian economy growth rate is estimated to be around seven to eight percent by year 2015-16. Rapidly growing population with 1.2% annual change. Chronic unemployment (A person is considered employed if he / she works for 273 days of a year for eight hours every day. )Unemployment in India is mainly structural in nature. Low rate of capital formation due to less saving rate. Follows Labour Intensive Techniques and activities. While Indian economy introduction is started, the major focus is always on the agriculture sector. This is because Indian economy is based on agriculture.52% of the total population of India depends on agriculture. According to the 2011-2012 survey of Indian agriculture contributes 14.1% of the Gross Domestic Product (GDP). It was 55.4% in 1950-1951. India is the second largest sugar producer in the world (after Brazil). In tea production, India ranks first. (27% of total production in the world). Wheat production: Uttar Pradesh is the largest producer. Punjab and Haryana is then the second and the third largest producer of wheat. Rice production:The principal food grain in India is rice. West Bengal is the largest producer. Uttar Pradesh is the second largest producer of Punjab and is the third largest producer of rice. The national income is the sum total of the value of all the final goods produced and services of the residents of the country in an accounting year. CSO: Central Statistical Organization is under the Department of Statistics. Govt. of India is responsible for estimating the national income.CSO was founded by Prof. Mahalanobis. CSO is assisted by the National Sample Survey Organization (NSSO) in estimating National Income. Gross Domestic Product (GDP) is the money value of final goods and services produced in the domestic territory of a country during the accounting year. In India Gross Domestic Product (GDP) is larger than national income because net factor income from abroad is negative, i.e. foreign payment is larger than the foreign receipt. 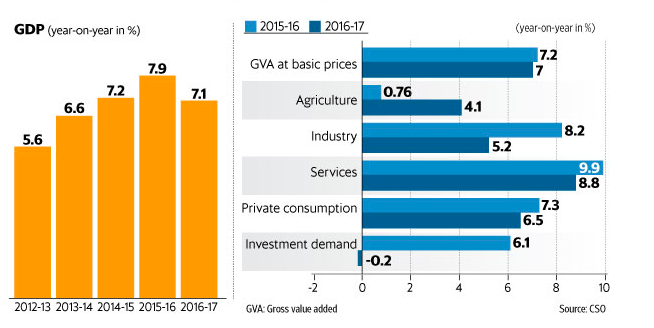 The Gross Domestic Product (GDP) in India expanded 1.50 percent in the first quarter of 2017 over the previous quarter. GDP Growth Rate in India averaged 1.67 percent from 1996 until 2017, reaching an all time high of 6.20 percent in the second quarter of 2009 and a record low of -2.30 percent in the first quarter of 2009. 1. Primary Sector: When the economic activity depends mainly on exploitation of natural resources then that activity comes under the primary sector. Agriculture and agriculture related activities are the primary sectors of economy. 2. Secondary Sector: When the main activity involves manufacturing then it is the secondary sector. All industrial production where physical goods are produced come under the secondary sector. 3. Tertiary Sector: When the activity involves providing intangible goods like services then this is part of the tertiary sector. Financial services, management consultancy, telephony and IT are examples of service sector. In Indian economy introduction, the sectors of economy based on other basis is also required to get a clear picture of the strengths of Indian Economy. 1. Organized Sector: The sector which carries out all activity through a system and follows the law of the land is called organized sector. Moreover, labour rights are given due respect and wages are as per the norms of the country and those of the industry. Labour working organized sector get the benefit of social security net as framed by the Government. Certain benefits like provident fund, leave entitlement, medical benefits and insurance are provided to workers in the organized sector. These security provisions are necessary to provide source of sustenance in case of disability or death of the main breadwinner of the family without which the dependents will face a bleak future. 2. Unorganized Sector: The sectors which evade most of the laws and don’t follow the system come under unorganized sector. Small shopkeepers, some small scale manufacturing units keep all their attention on profit making and ignore their workers basic rights. Workers don’t get adequate salary and other benefits like leave, health benefits and insurance are beyond the imagination of people working in unorganized sectors. 3. Public Sector: Companies which are run and financed by the Government comprises the public sector. After independence India was a very poor country. India needed huge amount of money to set up manufacturing plants for basic items like iron and steel, aluminium, fertilizers and cements. Additional infrastructure like roads, railways, ports and airports also require huge investment. In those days Indian entrepreneur was not cash rich so government had to start creating big public sector enterprises like SAIL (Steel Authority of India Limited), ONGC(Oil & Natural Gas Commission). 4. Private Sector: Companies which are run and financed by private people comprise the private sector.Companies like Hero Honda, Tata are from private sectors. Here are the most frequently asked Indian Economy questions in General knowledge section of exams. These questions will be useful for your practice for IBPS, SSC, UPSC exams, state PSC exams, entrance exams, bank exams, NEET exam (National Eligibility and Entrance Test) or any other competitive exams. LearnFrenzy provides you lots of fully solved "Indian Economy" Questions and Answers with explanation.